YOU ARE #1! At E-Z Auto Credit, We are professionals and our mission is to serve our guests. That makes you #1 in our book! E-Z IN-HOUSE FINANCING. We offer in-house financing and you can get pre-qualified in 10 minutes or less. 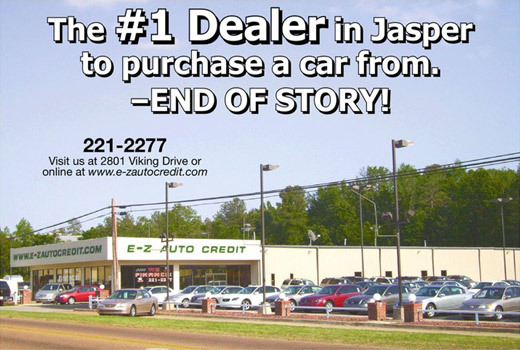 At E-Z Auto Credit, we understand your past, so we can help with your future. YEARS OF EXPERIENCE. We have over 70 years of combined experience that you can rely on to help you today. Our knowledge and understanding provide a relaxed, professional, friendly atmosphere for you. WARRANTY. The majority of our vehicles come with a 6 months / 6000 mile limited warranty, some of our vehicles even have factory warranty left. WE HELP BUILD YOUR CREDIT. E-Z Auto Credit reports to the Credit Bureau. Reporting positive credit will help rebuild your credit. Why buy from someone who doesn’t report your good pay history? CARFAX VEHICLE HISTORY REPORTS. We are not scared to show you the recorded history of the vehicle you are looking to buy and it’s FREE! NO COMMISIONS. This eliminates the salesperson from trying to force a vehicle on you and makes the buying process less stressful. EXCELLENT CUSTOMER CARE. We strive to put the right person in the right vehicle in the right situation. The right person wants to improve their credit. The right car fits your personal needs and fits your budget. The right situation is the commitment to a good paying history, which helps you improve your credit, your life and get the car or home you deserve. BRINGING A CUSTOMER TO US PAY’S BIG! We offer rich incentives to refer others, like a $250 Wal-Mart gift card. WE LOVE OUR CUSTOMERS! We have special give-aways, like $100 in free gas, and other prizes to our customers to show APPRECIATION.